Investors have spent the last three months buying the idea that IBM (NYSE:IBM) is fundamentally changing and about to become a growth company again. 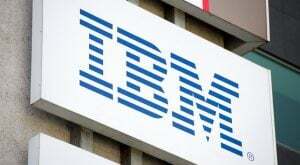 Credit Red Hat (NYSE:RHT), the open source software company IBM is in the process of acquiring for $34 billion. Red Hat’s December quarter had revenues growing almost 14%, year over year, and non-GAAP earnings growing at 26%. IBM is expecting revenue of $18.65 billion when it reports April 16. In last year’s first quarter IBM had revenue of $19 billion. In its most recent earnings call, Red Hat reported $879 million for the quarter. Red Hat will not, by itself, solve IBM’s problems. Investors buy IBM stock for the bottom line, not the top line. IBM is expected to bring in almost $2 billion in earnings for the March quarter. IBM is also expected to announce a hike to its dividend. IBM has been shrinking for years, achieving growth through IBM stock buybacks. The current $1.57 dividend now yields 4.39%. But optimism over the coming Red Hat merger has sent the stock up 26% this year. Top-line gains have been priced-in before they appear. That’s why our Luke Lango wrote “sell, sell, sell” in his earnings preview. IBM reports earnings tomorrow after market close. On a near-term basis, IBM is overbought. Other analysts agree. IBM is trying to transform itself from an old-line tech company into a hot young tech company, but its marketing of that has gotten ahead of reality. For years IBM has been expanding its profits by laying off its most productive workers. It’s caught up in an embarrassing age discrimination lawsuit. One-third of its workforce is now located in India. About half of IBM’s revenue is still in withering areas like mainframes, not in the “strategic imperatives” of cloud and artificial intelligence it’s touting to investors. Last year its highly advertised Watson AI unit had to lay off workers after getting ahead of itself. IBM CEO Ginni Rometty came up through marketing, like her predecessors going back 100 years. That marketing focus is at the heart of IBM’s current dilemma. What the people piling into IBM want is an immediate transfusion of Red Hat growth into the old-line company. Replacing Rometty with Red Hat CEO Jim Whitehurst would send the stock higher, faster than any other move the company could make right now. But that’s not going to happen. Red Hat has only been promised autonomy within IBM. That could turn out to be a “pie crust” promise, easily broken down the road. Red Hat has a technical corporate culture, an “open organization” with lots telecommuting engineers. IBM still has a marketing culture built around business suits and hierarchies. Red Hat is built around collaborating with customers and their technical staffs. IBM was built on telling companies what to do. Red Hat must convince its own employees, customers and investors that it’s going to transform IBM. At this writing that process has not even begun. If IBM were to become a growth story again, the stock would zoom. IBM still has 43% more annual revenue than Facebook (NASDAQ:FB), which has more than three times its market cap. IBM has staked its future on becoming a cloud company. But in doing that, it is going head-to-head with Microsoft (NASDAQ:MSFT), Amazon (NASDAQ:AMZN), and Alphabet (NASDAQ:GOOGL), each at least 50% bigger by revenue, and each about 8 times bigger by market cap. If you buy IBM today, you’re betting the former “Big Blue” is about to become a scrappy underdog and win. That’s a speculation, not an investment. Dana Blankenhorn http://www.danablankenhorn.com is a financial and technology journalist. He is the author of a new mystery thriller, The Reluctant Detective Finds Her Family https://www.amazon.com/Reluctant-Detective-Finds-Her-Family-ebook/dp/B07FSRDR4Y/, available now at the Amazon Kindle store. Write him at [email protected] or follow him on Twitter at @danablankenhorn. As of this writing he owned shares in MSFT and AMZN. Article printed from InvestorPlace Media, https://investorplace.com/2019/04/ibm-stock-wont-around-as-fast-as-investors-expect/.